When I was 11, our scout troop participated in an overnight camping experience near Bedford, Indiana, at a location known as Blue Springs Cavern. I had never been in a cave before and, I doubt our scoutmaster had either. In spite of the Scout motto, we were seemingly *so* ill-prepared. Blue Springs Cavern was a “wet” cave (duh). And to make matters even worse, about 30 minutes in, the battery in my big 6-volt flashlight began to fail. Two hours in, half our troop was “in the dark,” in more ways than one. I could make out ghost-like shadows way up ahead, silhouetted by the leader’s carbide lamp atop his fancy caving gear helmet. (Show-off.) In one section of the cave, we stepped from boulder to boulder (in the dark), across a cat-walk-like feature with drop-offs on each side that seemed two-stories high. (Maybe the guide was just *trying* to scare us. For those of us without light, it worked.) We waded through ankle-deep water in a “room” with a roof-top clearance of just 4′, forcing us to “duck-walk” through the mud. Finally it was lunchtime. My peanut-butter-and-jelly sandwich was soaking wet. But perhaps the most discouraging news came right after lunch, when we learned that the only way out was the way we had come in. Only then did we realize that we had to do the whole thing again in reverse. When we finally climbed out of the “chimney” about 3 hours later, other scouts were bombing us with fresh-made snowballs. To our absolute shock, it had snowed 3″ while we were underground. That day left an indelible mark on me. In fact, in many ways, perhaps I’ve never fully recovered. To this day, I jokingly carry a flashlight in my right pants pocket wherever I go. (Maybe it’s “jokingly,” but the fact is, I still carry it, nonetheless.) Did I mention that there’s a backup light in my briefcase? And — yes, I confess — spare batteries there too. I guess some things we never forget — or quite get over. And these are not ordinary lights, either. They’re both Surefires. Their lithium batteries have a 10-year shelf-life. In fact, they aren’t really just flashlights. 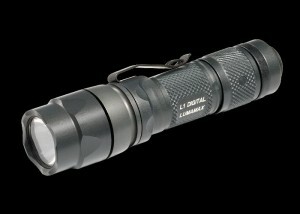 They’re 100-lumen “illumination devices.” At least that’s what Surefire likes to call them. How ’bout you: have you ever been jaded by an event in your life that you can’t quite forget. A broken relationship? … the loss of a loved one you can’t quite shake. … a bankruptcy, failed business, ejection from a sensitive field? My theory is — we *all* come with some baggage. Those gremlins in our past, in fact, are part of what molds us into who we are today. To me, it’s not necessarily all about forgetting the past; it’s sometimes about compensating for it. Of course, some of these hiccups could have been prevented through better training, clarified expectations, or even the right tool. (A simple dependable flashlight would have done the trick with me.) Although we can’t Monday-morning quarterback the past, we can and should learn from it. So — it’s worth asking… How do we train our workers so they can better deal with ejection from a sensitive land? What kind of tools (whether they be tangible tools or intangible ones) should we give to those traveling halfway around the world? How can we, as churches, agencies, and families, reduce the likelihood of post-Blue-Springs-Cavern syndrome? That question deserves our priority attention, every day of our lives. Your caving experience story was great. Yes, we all have past experiences which leave a lasting impression and hopefully make us wiser for the future. This issue of _Brigada Today_ is Copyrighted 2011. I’ll admit that I’ve given in to the marketing by Surefire: I love my L1 Digital Lumamax! :-) It’s my constant companion.